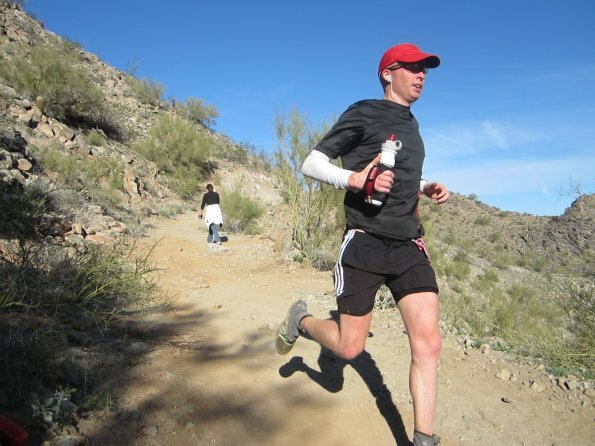 This past week, I was thankful I had registered for the San Tan Scramble 50k. The weather reports for the Denver Metro area forecasted 1-2 ft of snow! The storm was expected to hit town just a few hours after our plane would fly out of Denver International Airport. We landed in Phoenix on Thursday morning, greeted by blue sky and 70 degree temps. Within an hour, my wife and I were sitting on the patio of an excellent vegetarian restaurant called, "True Food Kitchen" in Scottsdale, AZ. Needless to say, it was awesome......and I appreciated every moment after several months of cold, icy, training in Boulder. We drove to Queen Creek...which seemed to be about 30 minutes from the Phoenix Airport. 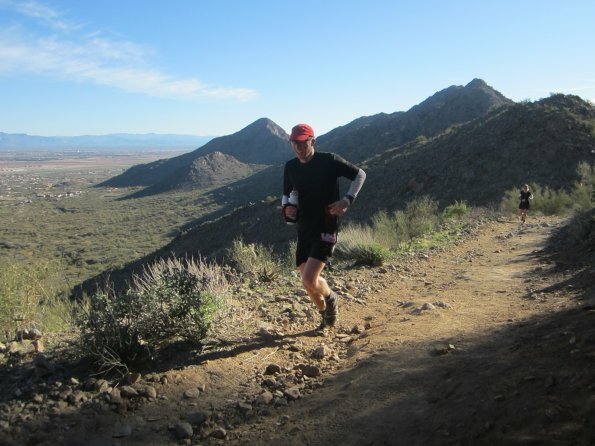 I broke away and used a borrowed mountain bike to scope the 10.3 mi loop of the San Tan Scramble 50k course. At the park, I paid the $6 parking fee and let the park staff know why I was visiting. They were welcoming and used a highlighter to mark a trail map of the course for the race. They let me know the course markings were already in place. I rode the course and quickly had to dismount several times due to thick desert sand. I was glad I had found the time to check out the course, because these sections of deep sand can be devastating if they hit you by surprise. The course was a basic loop course, with rolling hills, single/double track, and 10-15% soft sand. The trail moved in and out of dry river beds. The terrain was littered with cactus, shrubs, and stereotypical desert background. Truthfully, quite beautiful to me having come from such cold climate in February! The course loops three times...during each loop, a steep hill must be navigated to the final aid station before finishing the 10.3 mi loop. I parked the bike and ran this vertical section in preparation for the race. The footing was excellent, compared to Colorado. The rocks were laid upon the softer desert sand, so the descent was very soft. The climb itself was not quite "runnable" in my terms...but the vertical ascent itself was not very lengthy, so I planned for a necessary run/hike to navigate this hill during my race planning. Having seen the course first-hand, I headed back to town and rested for Saturday. Being from out of town, I had to reach out to the local running community for assistance with regard to logistics. Local stud, Jeremy Dougherty, was kind enough to offer me a ride and pick me up at 5:30am...what a guy. We made our way to the race start area. The organization was apparent from the on-set. The registration process was smooth and easy. The tables were well-marked and the volunteers knew what was going on.....you believe that!? I got checked in and ran some warm up miles on the road into the park. ﻿﻿If there is one thing I can share about this event, and the Aravaipa Running organization, it is they put on a professional operation. The race headquarters were decked out with propane heaters for the athletes to mill about in the cold morning pre-race (Colorado commentary left out intentionally). Everyone was checked in and ready to rock by the time the race announcements were made. The start banner was erected and the drop bag location was marked as well. The race was monitored by chip timing system and several large flat screen televisions provided information about the lap and timing of each athlete. It was quite impressive. I tuned into my heart race early in the race. As usual, I recognized the influence of adrenaline and fought my tendency to run harder. I held back despite feeling like I was barely jogging. Local studs Jeremy and Jay headed out amongst the lead group in the first few miles. I cruised through the first lap, barely noticing those pesky sections of dry sand. I was glad I chose to wear gaiters, as the sand would have found its way into my shoes quite easily. I would definitely recommend gaiters for this race. I approached the hill at mile 8 and headed up for my first pass. As expected, the first climb was easy. ﻿﻿﻿﻿﻿﻿﻿﻿I came into the start area to start lap 2. Jeremy, Jay, and Adam Barstad were running together. I tucked in behind them in an effort to pace my 2nd lap. Within a couple miles, Jeremy and Jay stepped back and I found myself behind Adam. His stride reminded me of San Diego ultra stud Ben Hian. Coming into the final lap, I grabbed some gel from my drop bag and acknowledged my higher heart race. I dismissed it and figured it was the last lap so it should be expected. The soft sand became more annoying and I knew my legs were definitely getting tired. Despite that, I was able to maintain a solid clip...all the while, thanking myself for doing tempo work for the past few months at the recommendation of Coach Cindy. I rounded the corner to get up and over that hill one last time. My legs were really feeling the miles...I got up and over the hill and ran down the steepest part of the race to the last aid station. I quickly dumped coke in my bottle, knowing I was nearing meltdown. I headed back up the trail to tackle one last ascent. Out of nowhere, Adam Barstad returned and pounced up the trail in front of me. I knew he had the gusto......I uttered a, "Go get em" and knew I lost a position. I climbed the last ascent, admittedly, quite exhausted...and enjoyed 10-15 seconds at the top to catch my breath. I sprinted down the last hill...trying to get my feet and legs to respond fast enough to avoid a hard fall. At the bottom of the hill, I did take a hard fall, face first...I had to laugh it off and run to the finish. Adam was there and told me we had finished 2nd and 3rd to Matt Schmitt (winner of 2011 race). What a day. In all, I really enjoyed this race from start to finish. 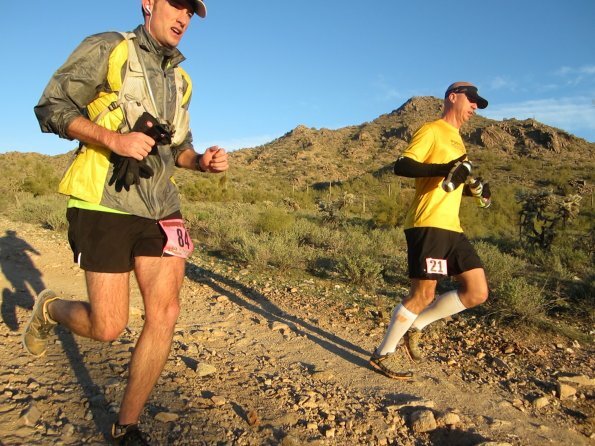 The RD and Aravaipa Running company were top notch. I had several bad race experiences in 2011, which were mostly due to poor organization on the part of race staff. For this reason, I give great value to a race that is well organized and managed by professionals. 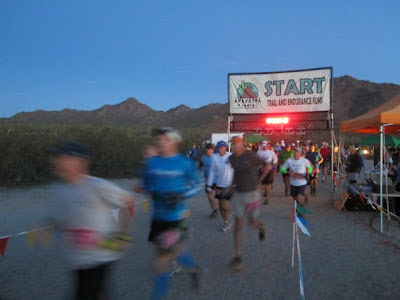 I highly recommend the San Tan Scramble 50k or any other event managed by Aravaipa Running. The local running community was very welcoming...I flew back to Colorado with a few more running friends. I've started negotiations with my wife, Jen, about a return trip next year for another Arizona race. Great race report. Awesome finish! !